Just a short drive away from the Fine Art Studio of Rotblatt-Amrany, a celebration was recently held in honor of one of the world’s most recognizable food icons. Orville Redenbacher was remembered at the 36th Annual Popcorn Festival in Valparaiso, Indiana, the weekend following Labor Day. Orville Redenbacher dedicated his life to agriculture. Much of his work was done in the area of Valparaiso where he grew up. The legendary face of popcorn started out as a Farm Bureau Extension agent and owned a fertilizer company. From there he developed new strains of corn plants, one of which he chose to use for his mouth-watering self-named popcorn. Orville Redenbacher popcorn went from being sold from his car to being advertised on national television, making Orville one of the most recognizable personalities in the television business. Orville Redenbacher popcorn is now part of ConAgra Food Corporation and is a part of a $16 billion annual net sales business. The city of Valparaiso held the first popcorn festival in 1979. The popular event includes craft booths, games and activities for the whole family, live music, a variety of food and the unique Popcorn parade. Orville Redenbacher himself was the grand marshal for several of those parades before his death in 1995. 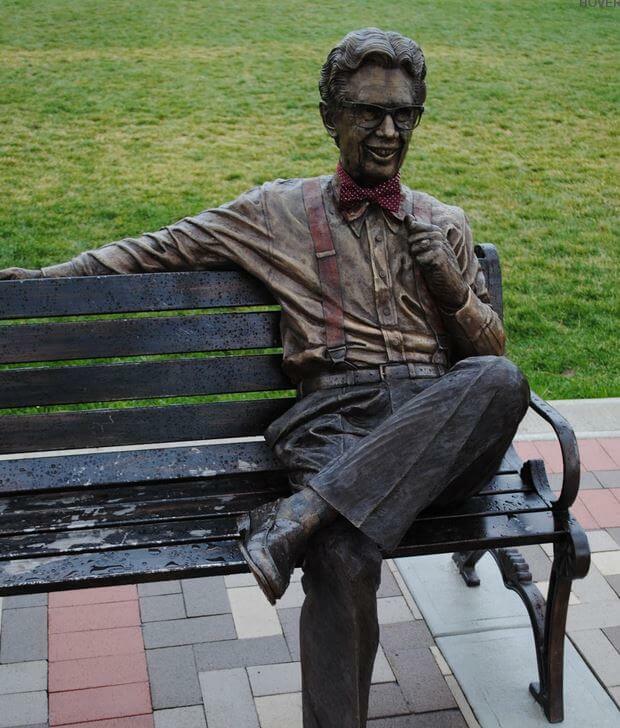 If you happen to have been a part of the yearly popcorn celebration over the past few years, then you probably saw the bronze sculpture of Orville Redenbacher seated on a bench downtown. The statue was one of three designs that was chosen by Orville’s daughter, Gail Tuminello and was created by artist Lou Cella. Lou Cella is a valued member of the Fine Art Studio of Rotblatt-Amrany and has been commissioned in the past for projects seen in places such as Wrigley Field, the University of Notre Dame and the U.S. Cellular Field…just to name a few. The project cost $62,000 and was unveiled at the Valparaiso Popcorn Festival in 2012. If you were unable to join this year’s festivities in Valparaiso, feel free to view more photos of this statue and many others on our website.